It is late December 2012. Instead of spending the Christmas break in my hometown I am thousands of miles away in the remote jungles of Vietnam. I have been invited here by WWF to help with biodiversity surveys in the Hue Saola Nature Reserve. As I climb with my guide through molasses-thick jungle vegetation, I think back to what I have given up to undertake this experience: warmth, family, friends have been traded for punishing field conditions. But I was also in a naturalist’s paradise. And I knew that if you spend enough time in the jungle you can be rewarded with sights that, to a true biologist, are priceless. Then it happened: two tawny blurs streaked across the riverbed and up the side of a low hill. My guide and I froze. He turned to me, whispered “Meo rung!” and pointed to a dense clump of leaves. OK, I thought, he says there’s a forest cat there—but where? I saw nothing. And then, as if it were an optical illusion jumping out at me from the page of a book, it was there: a spotted skin that stood out brilliantly in the early morning light. And yet, strange as it sounds, if I took my eyes off it even for a second the form dissolved back into the sun-dappled jungle vegetation. We carefully repositioned for a better look. I will never forget that next sight: eyes that burned like black suns glaring at me from a striped feline face. I had just seen my first leopard cat (Prionailurus bengalensis). Although it shares a name with its bigger cousin, the leopard cat is only distantly related to the common leopard (Panthera pardus). The leopard cat is approximately the size of a housecat and is strikingly marked: spots, streaks, and stripes are scattered across a buff-colored coat. It has the distinction of being the most widely distributed small cat on the Asian continent: from an ecological perspective it is one of the most successful felines on the planet. It lives from the snowy mountains of Russia to the arid desserts of Pakistan to the humid tropical forests of Southeast Asia—and everywhere in between. It eats anything small enough to catch: birds, rodents, lizards, and insects are all fair game. It can also survive in human-dominated landscapes: studies in Indonesia have documented thriving populations in farmland areas. This adaptability means that the species has fared far better than other members of the cat clan. It is listed under the IUCN as Least Concern. In Vietnam and Laos it lives in a variety of forested habitats and is found throughout both countries. 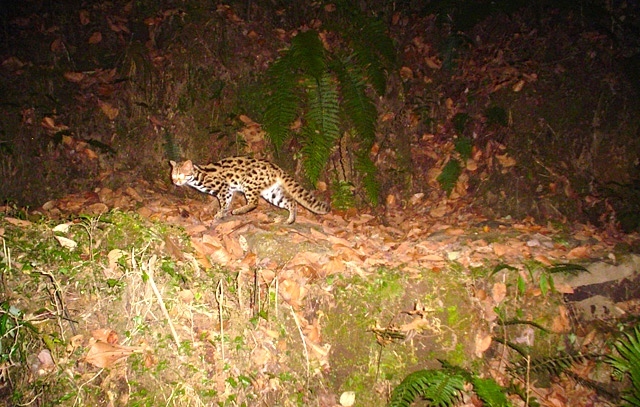 It is the most common feline in the central Annamites and has been photographed several times by camera traps placed in the Hue and Quang Nam Saola Nature Reserves. Even so this remarkable small carnivore is not out of danger. Snares, which have been called “the drift nets of the land,” undoubtedly capture leopard cats in the Annamites. And unlike other animals we have covered in Species Spotlight the pelt of the leopard cat has trade value. Skins of this species are not uncommon in some rural markets of Vietnam and Laos where the beautiful spotted pelts are in demand. Still—I take comfort knowing that this cat is doing better than other Annamite jungle mammals. Let’s hope that it stays that way.